Who loves camping with all of their heart? I do! I do! And from the feedback I’ve been getting, y’all are just as excited as I am for camping season! 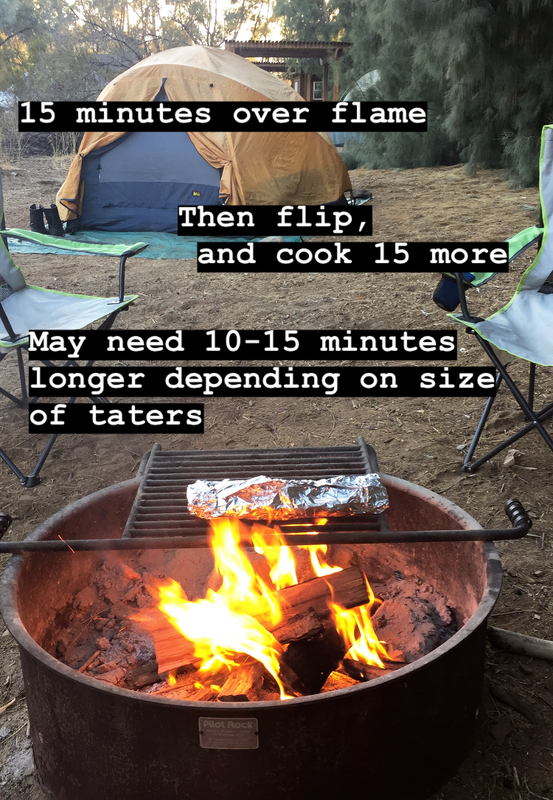 I’ve continued to share my camping tips and tricks, outdoor hacks, and firepit recipes on my Instagram stories, and I’ve loved seeing all of your enthusiastic comments. So here’s another super easy, totally delicious tried-and-true campfire recipe. 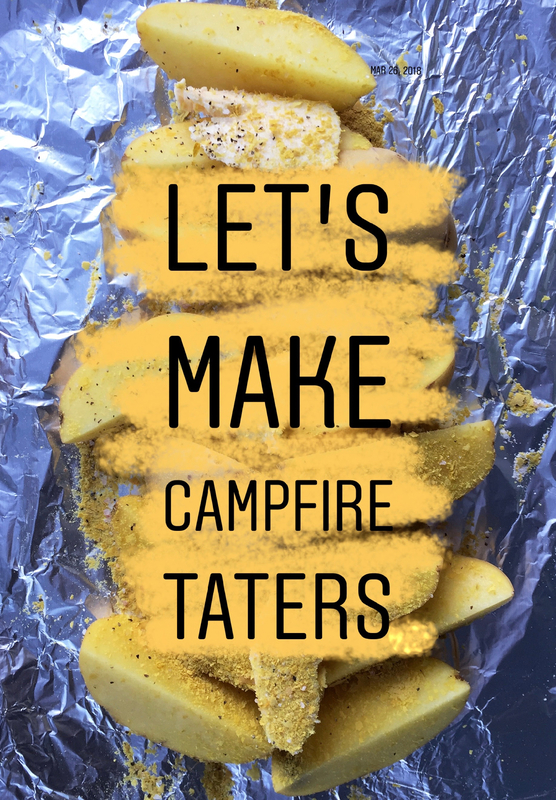 Personally, I think potatoes are the perfect camping food because they’re filling and comforting after a long day of hiking or swimming or whatever it is your family likes to do in the great outdoors. Taters never fail to satisfy, and this recipe is 100% kid-approved, parent-approved, and even reader-approved. That’s right — I’ve already had a number of readers tell me they’ve made and loved this recipe! I like to use thin-skinned potatoes, though russets will work just fine. Cut the taters into strips, roughly the size of steak fries. 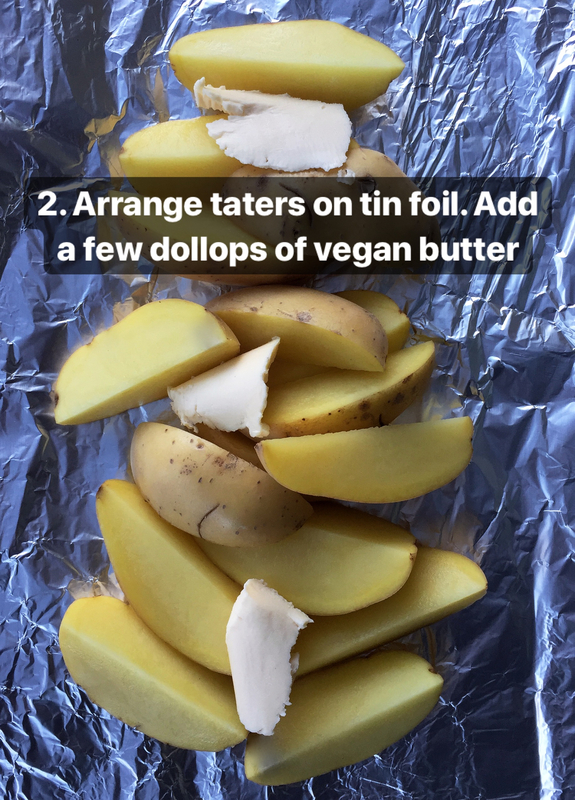 Spread the potatoes on a large piece of tin foil (I actually double layered it) and add a few spoonfuls of vegan butter (coconut oil or olive oil work too, if you don’t do processed stuff). 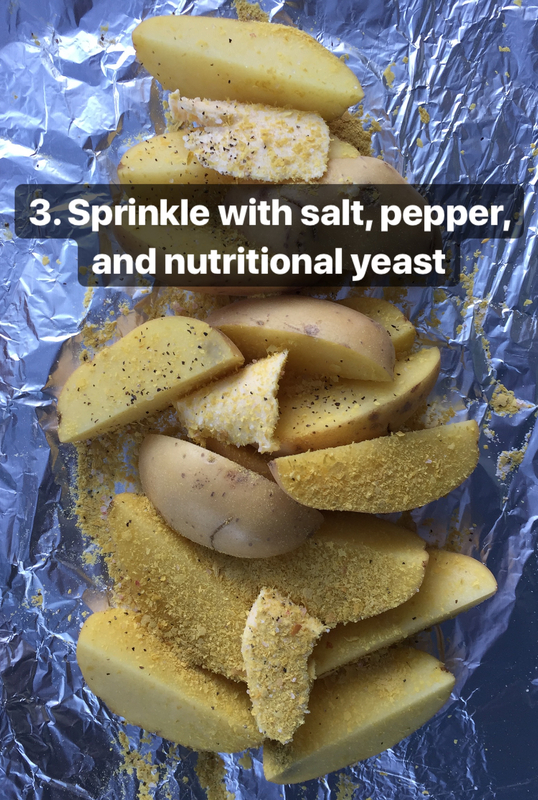 Sprinkle the potatoes with a bit of salt and pepper, and a liberal dusting of nutritional yeast. Then, wrap it all up to make a little packet. It should be snug and well sealed. Set the packet over the campfire. You can put it directly into the flame — you want it to get hot. Potatoes need a lot of heat to cook, so it’s okay to put it right into the flame. Timing is tough because potatoes can be so finicky. Cook for at least 15 minutes on each side, but you may need to go 15 + minutes more after that. It all depends on the size of the potatoes and the strength of the fire. These pics are all from our camping trip in the Anza Borrego desert, which is when I first Instagrammed this recipe. But we love it so much that we made it again last weekend camping in Ojai. So trust me when I say, this simple, wholesome, no-fuss recipe does not disappoint! 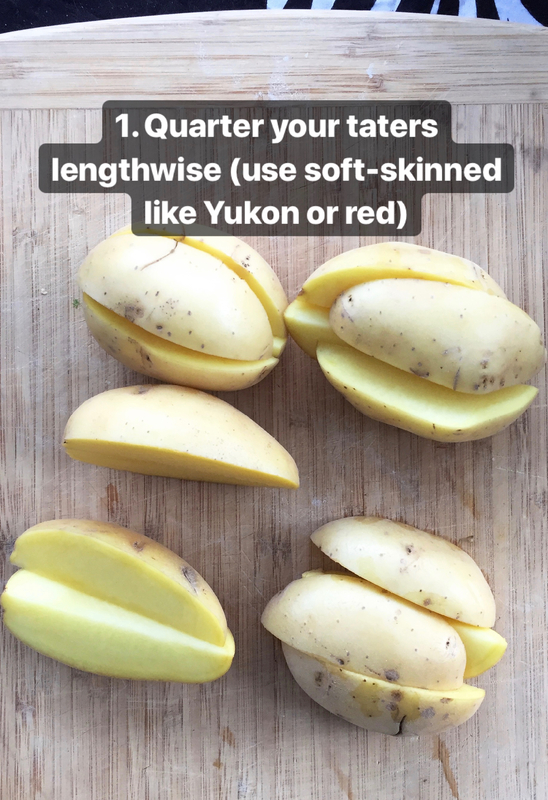 I made these potatoes after seeing Sayward’s Instagram story. My boyfriend and I have made these every Sunday since. Super easy, delicious and we save them in a glass jar in the fridge during the week and pull them out for side dishes and vegan breakfast hash! Thank you! I’m gonna give it a try! Love your posts! These look so good. I bought a slightly decrepit pop up trailer at the tail end of summer for 300$. It works, but needs some canvas love. I am trying to convince the husband that leaving it geared up all summer and taking Friday night trips is totally cool for one or two nights. He only halfway believes me and says camping is so much work. I’d love to drop everything and camp more. :) Maybe with super easy stuff like this he would be more willing to go! 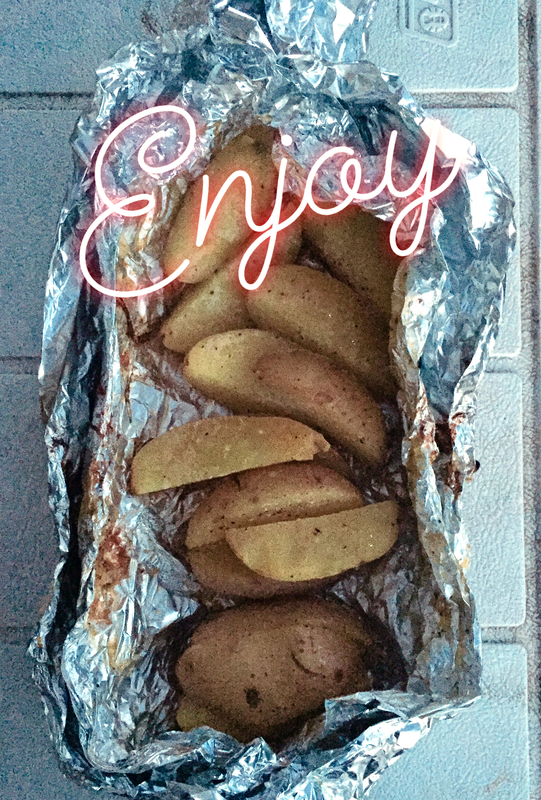 Funny, I never thought to quarter the potatoes and I always just throw whole potatoes (wrapped in foil) into the campfire — but they take foreeeeeever to bake through. When done they are incredibly soft and fluffy inside and amazingly good, but they’re always dessert rather than part of the dinner! I’m totally going to adopt this system and maybe in future our tofurky dogs and brats will actually be eaten WITH the potatoes!! I’m so glad you’ve made them and love them like we do! They have become our camping staples, we make them eeeevery time. And we do the same thing — leftovers into a breakfast hash! And it’s sooooo worth it! Get your husband out into the wilderness. A few mornings of absolute quiet sipping coffee by thte campfire and he will be converted!